For the last few weeks Guinness and I have both been trying out our own fitness trackers. 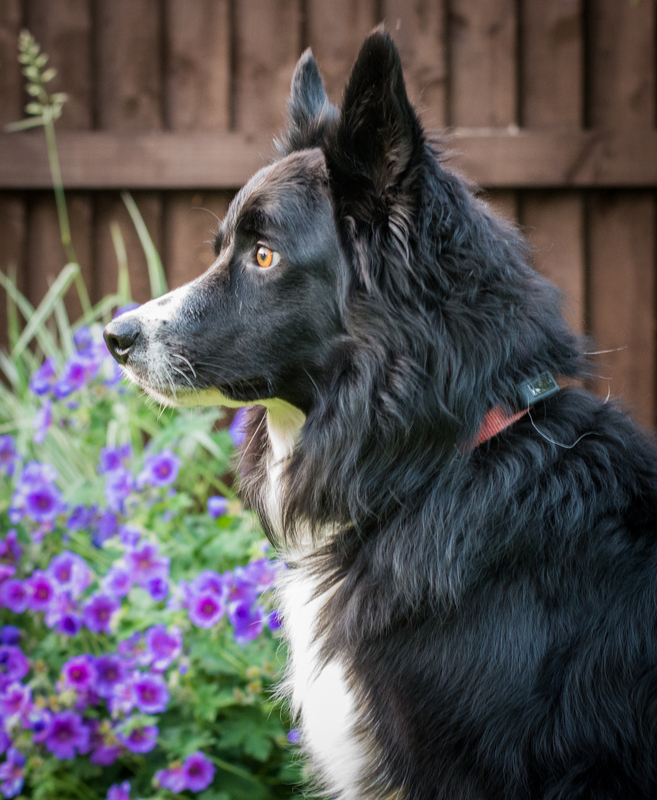 I went for the FitBit Charge HR and Guinness has been using the Tractive Motion Sensor, currently the first and only pet tracker available in the UK. One of the first comments I received upon proudly showing off our new gear was “Why do you need something to tell you how active you are, you know how active you are!” A pretty good point to be fair, but what I like is information! Graphs. Charts. Diagrams. Written down facts and figures. I’m rubbish at tracking what Guinness does and even worse at tracking myself, but I find it so much easier to see and improve things when it is charted for me. But that’s all well and good if these things actually work. So, do they? Three weeks in and I’ll be honest, the novelty is starting to wear off. But that may just be me and my terrible attention span, even after a few months of owning a new car I’m itching to get a new one. But don’t worry, this review isn’t going to be as negative as its implying to be. I’ll start with the Tractive. Tractive make a GPS pet tracker (which is expensive and requires a subscription fee). What they also make is a Motion Sensor, which is what I have. 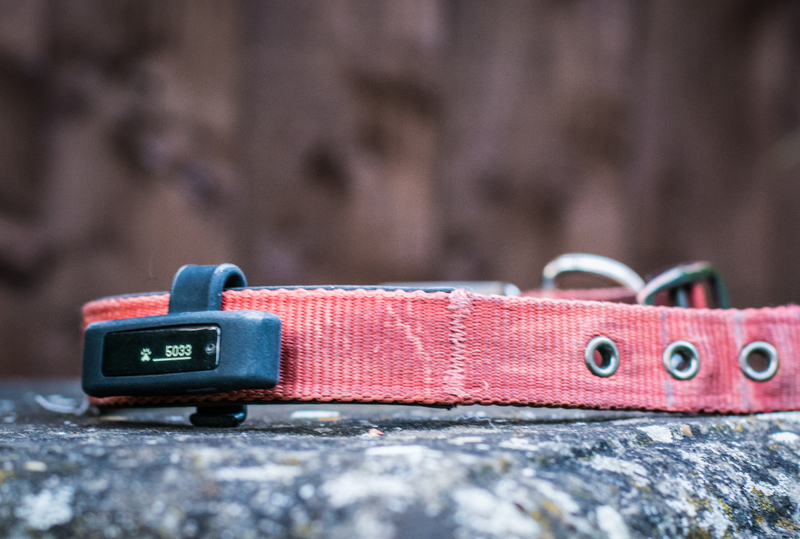 It’s basically a posh pedometer that clips onto the dogs collar and measures how active they are throughout the day. The Tractive doesn’t count steps, instead it measures the dogs activity and gives you a “pet points value” and summarises your dogs day into three percentages; time spent being “Lazy”, “Dynamic” and “Active”. Sounding good right? But what the hell is a pet point?! 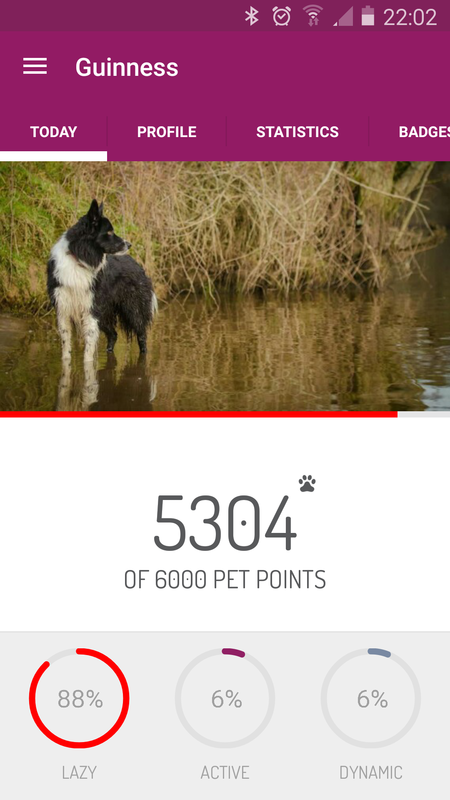 Well the only guide I have to go off is that Tractive says 3,000-6,000 points is ideal for a “medium active pet” and anything above is brilliant… but I still don’t really have much clue about the value of pet points. 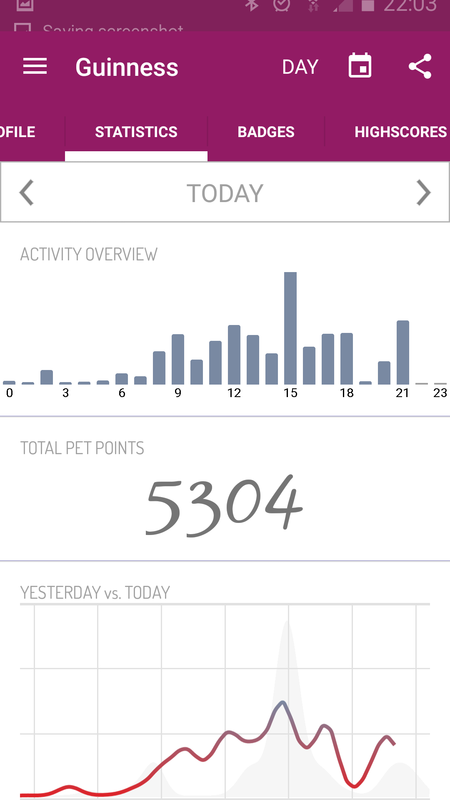 What I do love about the Tractive though is the graphs of activity for each day with an hourly level. I can see overnight that Guinness is virtually inactive, plus the most useful thing about this is that if I know he was left home alone (from 7pm to 9pm for example) I can later see exactly how active he was during this period. Turns out he is pretty much inactive when left alone, exactly what I’d want. 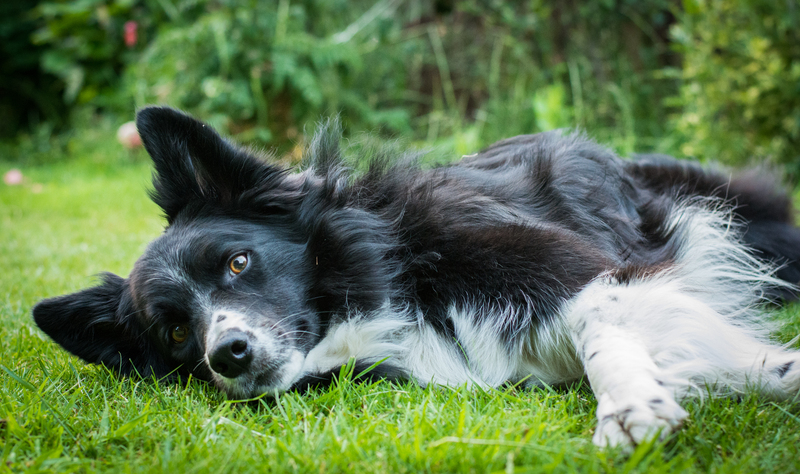 A dog that chills out and doesn’t potter around while left alone is a good sign that they’re not stressed, anxious or bored. (We’ve had a pretty busy day together today so he’s been fairly active wandering around). It hasn’t all been smooth sailing though. The Tractive is pretty rubbish at connecting to my phone, taking a few goes sometimes. (Although it seems to connect quickest when I’m sat in the van and Guinness is in the crate in the back). I’ve also had issues with the battery. The first week I used it, it lasted about 4 days, then when I charged it, despite the display showing it was charging and then fully charged, the Tractive wouldn’t turn on afterwards. After putting it on one side in annoyance for a few days I tried charging it through my laptop which proved to work. Then 4 days later the charge is dead. I don’t think 4 days of charge is unreasonable, although I’d expect more, but it’s the sheer fact that there is no indication of how much battery charge is left. I’ve previously never received a notification that the battery is low either, until this morning! I think you would need to sync it often to catch it at the right time for a battery notification. Now that I know the 4 days charge seems to be consistent I will be keeping better track of it, but it’s a slight niggle that could easier be improved. It terms of ruggedness it has so far survived Guinness charging through bushes & long grass, shaking, rolling, fetching and swimming. It was a heart in mouth moment the first time he plunged into the river wearing it, but I trusted Tractives “completely waterproof” claim and so far they have been proved correct. When I first put the Tractive on Guinness I wasn’t convinced it was going to stay on. It’s got a normal belt clip which is fairly strong, but I was doubting it. I reckon Guinness’ thick collar is helping to keep it on there as it’s a very tight, strong fit and I’d probably be less sure with thinner, smaller collars. But from what I’ve experienced it’s stayed safely throughout a pretty thorough test. Guinness also shows no sign of it bothering him, or being even remotely aware that it’s on his collar. It’s about the same height as the collar and not too long so it doesn’t get in his way. The mobile app is easy to use with lovely charts and data. You can only sync to your dog via Bluetooth so you have to be with them, which I don’t find to be a disadvantage. I don’t want to be constantly checking up on him while away and I get enough data from connecting at the end of the day and seeing his activity levels throughout. However it is a very limited amount of information given and I’d personally like to see more stats such as distance travelled and time spent running/trotting/walking. Now the FitBit I’ve been getting along very well with. It’s comfy to wear and although a little big and chunky, it isn’t ugly. It tells me the time with one press of a button and therefore has done the job of replacing my watch, and it gives me accurate details throughout the day about my heart rate, distance travelled in miles, calories burnt, steps taken and floors climbed. I chose the Charge HR as it’s reckoned to be much more accurate about calories burnt by using your heart rate, plus when I go for a jog or bike ride I can see exactly what heart rate zones I was in and for how long, therefore telling me what kind of impact that workout had. You have to remember to record your workout by holding the button for 3 seconds when you start and again when you finish, otherwise it doesn’t save your detailed heart rate information during the exercise. 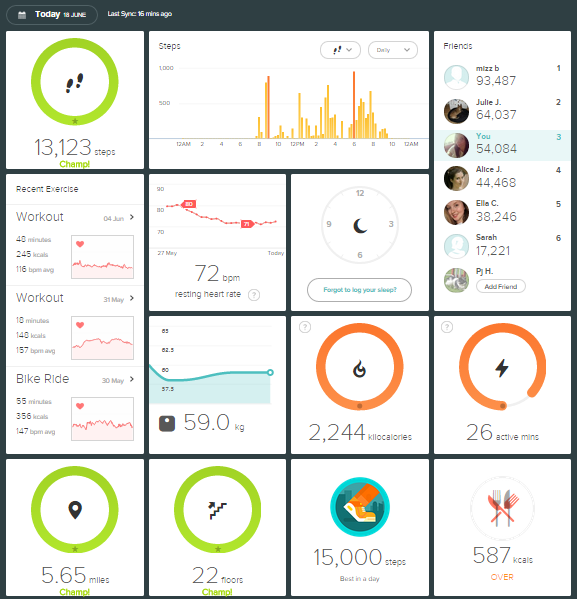 One downfall I found is that while cycling it doesn’t record distance or steps, as you aren’t moving in a normal walking pattern, however it still logs your calories correctly which is useful. The app is really easy to use and I started off by setting it with a goal of losing 5lbs to see how the FitBit tackles weight loss. Moment of modesty here, but I am a really healthy weight, therefore for me to lose 5lbs the FitBit expected my daily calorie intake to be quite low (but not unhealthily so). The FitBit works on the basis that you need to burn as many calories as you eat to maintain your weight, and therefore burn more than you eat to lose weight. This requires you to input your meals, something I used to love doing on a Nintendo DS Health Coach game. Using a data connection or WiFi the app easily finds most brands/food types you search for, or you can use the barcode scanner. I tend to eat the same few choices for breakfast and lunch and because it saves my most frequent foods the daily input of meals is pretty quick and easy. Burning more calories than eating though… not so easy! I love food and I’m not an exercise freak. So most days I tended to be in the Red zone, haven eaten a little bit too much. I soon changed my goal to maintain my weight. My results have varied each day from balance achieved to eaten too less to eaten too much. Keeping track of your exact stats this way really does make you think, but I’m finding my stomach and my busy schedules rules my decisions and therefore I’m not making any drastic changes, just simply keeping an eye on what I do. The only issue I found with the FitBit is the sleep tracker. It’s just not accurate. 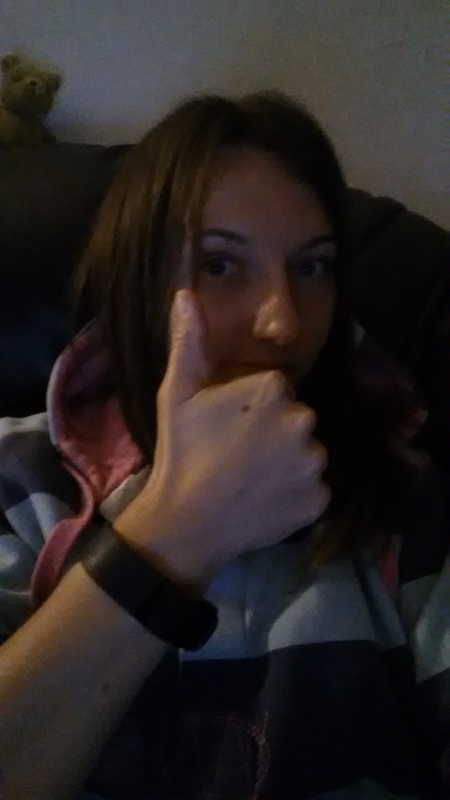 I found it a little tricky to sleep while wearing it for the first few nights but soon got used to it. However although it’s tracking exactly when I get into bed, it is not tracking when I am asleep. I often lie awake for about half an hour scrolling through social media or playing a few quick games and as I was having doubts I decided to pay more attention to the clock. One evening it was 10.30pm when I got into bed and then 11pm when I put my phone down and closed my eyes. The FitBit recorded that I’d slept from 10.30pm. Not true! This is annoying as I’d expect it to be perfect based on its reviews and price. The sleep charts it produced and the level of restlessness did seem to be quite accurate and interesting to see, although one evening I went to the loo in the middle of the night and was definitely 100% awake, but it had only registered me as being restless. On the positive I’m finding both the FitBit and the Tractive to be very useful! 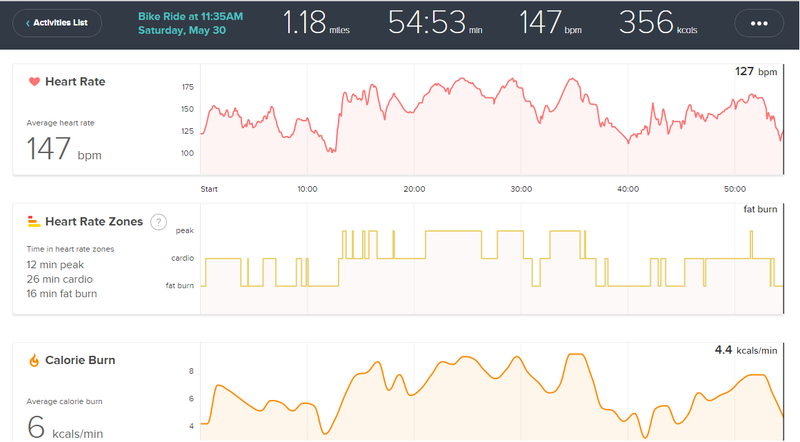 Seeing the data makes you want to exercise more, especially if you’re lacking a little below your target that day, and it makes you want to get good stats. I especially love the option to have Challenges with your friends with the FitBit. The group I’m in has Work Week and Weekend Challenges and I only just missed out on winning this weekend! There’s no doubt that the two trackers are both very insightful pieces of kit and for those like me who prefer to have something calculated and written down for you, it is very useful information. However as I said the charm is wearing off, I haven’t logged my food for this week and the bottom line is, I’ve not changed my behaviour at all to increase my amount of exercise on the days when I’m been below. I was already happy with the amount of exercise Guinness and I were getting beforehand and therefore if we don’t quite meet our goal one day, I don’t feel any need to do more to ensure we meet it. In terms of the Tractive, the most insightful information has been what I pretty much knew already, that he relaxes when left alone and overall he’s a fairly chilled out dog with bouts of exercise throughout the day. For me, the FitBit is motivating me and making me aware of what I am doing and what I am eating, but it’s only confirmed that I don’t need to change anything either. I think by being aware it will help me to maintain the levels, but if I want to spend a day on the sofa eating chocolate, it’s not going to make me feel bad about only getting 1,000 steps that day!